Military courts don’t issue divorces, so military members must get divorces from state courts like everyone else. Divorces filed in North Carolina courts are governed primarily by North Carolina laws, even when one or both spouses are in the military. However, some federal laws provide additional protection and guidance when military members are involved. North Carolina allows two grounds for divorce: separation for more than one year or incurable insanity for at least three years. Most North Carolina divorces are filed based on separation grounds. To file in this state, either you or your spouse must be domiciled in North Carolina for at least six months. Thus, if you are the military member, you must claim North Carolina as your domicile in order to file for divorce in the state, evidenced by such actions as paying North Carolina taxes. Most non-military spouses take on the domicile of the state where they live, so if your non-military spouse lives in North Carolina, you are likely able to file in this state based on her status as well. If you and your spouse can agree on how you want your property distributed, you can sign a settlement agreement to finalize your arrangement. If you cannot agree, the court will divide property according to North Carolina’s laws, which require equitable — though not necessarily equal — division. The court will consider various statutory factors before arriving at a decision, but there is no formula to predict exactly how much each spouse will receive. North Carolina law is unique in that you can get a divorce without deciding property issues. A North Carolina divorce decree just dissolves the marriage unless you ask the court to address property distribution during the divorce. As long as you preserve this issue by bringing it up during the divorce, the court’s hearings on these issues may take place after the divorce is final. Retirement pay is considered property divisible by North Carolina courts in your divorce. The Uniformed Services Former Spouses Protection Act, a federal law, specifically allows state courts to divide retirement pay. This act also determines which military benefits your non-military spouse gets to keep after your divorce. 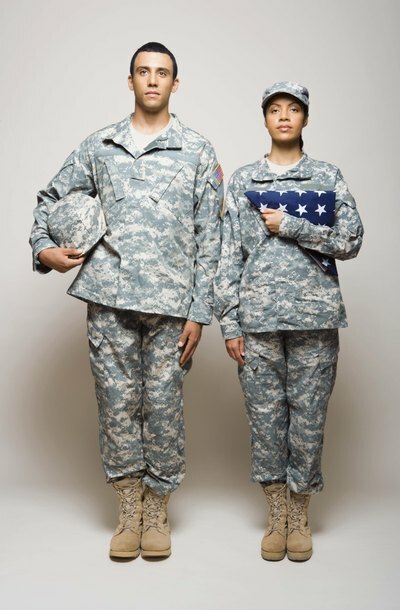 If you were married for at least 20 years, served for at least 20 years and had at least 20 years of overlap between your marriage and military service, your spouse is eligible to keep many of her benefits, including health care and commissary and exchange privileges. Like property division issues, North Carolina courts determine child custody arrangements according to North Carolina laws. If you and your spouse cannot agree, your divorce court will use various factors to determine a custody arrangement that is in the best interests of your child. These factors typically include each parent’s relationship with the child, the child’s relationships with siblings and other family members, each parent’s character and each parent’s ability to support the child’s education. As a military member, you may want to address military-specific issues in your custody arrangement. For example, your custody order can address what happens when you deploy or are stationed overseas. Most people are not able to think clearly in the hours or even days after they receive divorce papers. Although the laws are slightly different from state to state, most courts understand this and give you time to respond. You don’t necessarily have to act immediately, but you must do something eventually if you’re going to protect your rights. No state forces a spouse to stay married just because her partner does not respond to her divorce petition -- she’ll just move forward with the proceedings and obtain her divorce without the spouse's participation.